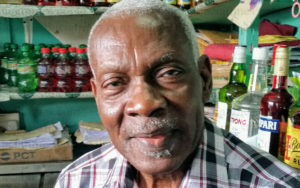 Former City Councillor, Earl Lewis, believes there are insufficient comfort stations in the Saint Lucia capital. “The reason I would say so is the amount of minibuses parked all on the roads and when you need to urinate, you need a place of comfort – the few we have here are not sufficient,” Lewis told St Lucia Times. He observed that most business places do not have urinals for members of the public, including tourists who visit Saint Lucia. Lewis, who runs City Gate Bar on Jeremie Street, said the bar has toilet facilities. He disclosed that he has been speaking with the authorities to utilise a spot opposite the Cosmopolitan Bar on Victoria Street to build a comfort station. “You have a bus terminal right on that street and back to it you have the Morne du Don bus stop. This would be an adequate place to have a comfort station,” the City businessman told St Lucia Times. Lewis said he once ran the Cosmopolitan Bar which is no longer in operation. “What these guys are doing since Cosmopolitan Bar is no longer in operation, they go in my backyard and urinate in the gutter there and have the whole area with the stench of urine,” he complained. Lewis spoke against the backdrop of a crackdown by the City Police on persons who urinate in public. Just recently fifteen people, including a woman, were held for indecent exposure in connection with the practice and the City Police have vowed to continue making arrests. They have warned persons who patronise bars that have no toilet facilities to beware of relieving themselves in public. However a bar operator on Jeremie Street blamed the government for the problem of bars not having toilets for use by their patrons. The operator asserted that toilets should have been a prerequisite for the issuing of permits to operate that kind of business. Imagine there are laws that restrict the concentration of bars in an area, proximity to schools and places of worship and how likely they are to be a nuisance to the residents of an area. All those bars in Castries violate those very same laws those authorities that grant them permission in the first place. Or they turn a blind eye to it. Pass under the market at 5 a.m. You have people taking shot of white rum for breakfast. Those people become a burden on the already garbage healthcare system and taxpayers foot the bill. What a system. Ministry of health should make sure bars have toilet facilities. Also public restroom are needed in key area with caretaker to make they are sanitary at all times.